Adopted on February 26, 2009. Governor David Freudenthal signed legislation created by Senate File No. 16 on February 26, 2009. Upon his signature, Act No. 20 declared that Sheridan's green hairstreak butterly, (Callophrys sheridanii,) is the state butterfly of Wyoming. The law goes into effect on July 1, 2009. Sheridan's green hairstreak was adopted as Wyoming's State Butterfly on February 26, 2009. This lovely insect is distinctive, being one of the few green butterflies in our region. 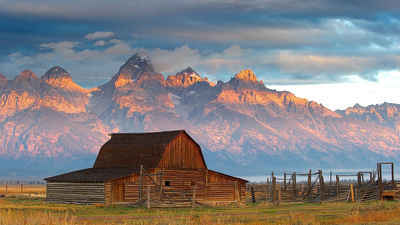 It was first discovered in 1877 near the location of present-day Sheridan, Wyoming. Both the town and the butterfly are named after Lt. General P.H. Sheridan, a famous Civil War commander. However, the butterfly was actually named before the town. The natural distribution of Sheridan's green hairstreak ranges northwards to southern Canada, westwards to California, southwards to northern New Mexico, and eastwards into western North Dakota. 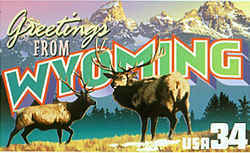 In Wyoming the butterfly is most commonly found in foothills and canyons at elevations up to 8,000 feet (2440 m). Callophrys sheridanii, common name Sheridan's Hairstreak and Sheridan's Green Hairstreak, is a butterfly in the Lycaenidae family. It is found along the south coast of British Columbia and parts of Nevada, Arizona, Saskatchewan, North Dakota, and New Mexico. In 2009, this species was adopted as the U.S. state butterfly for Wyoming. Sheridan's green hairstreak occurs widely across Wyoming in mountains and foothills, wherever its food-plant (sulphur flower) is found. 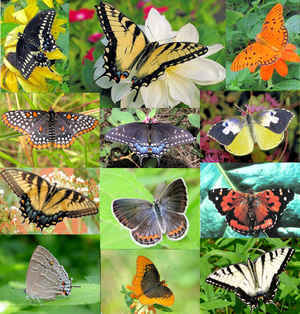 The butterflies visit various wildflowers to feed on nectar. This butterfly flies from March to early June and is the earliest butterfly to emerge from a chrysalis in Wyoming. Like the robin in Wyoming and other states, this green butterfly is a symbol of the arrival of spring in Wyoming. Adults may be seen flying during the earliest warm days of spring, while snow is still melting nearby. It is a small butterfly, with wing spans averaging 2.2-2.9 cm (less than one inch). However, the bright green color of the underside of the wings is very distinctive, making the butterfly quite easy to identify. There is a line of white dots across the underside of the hind wing, which may join to form a nearly solid white line. The upper surface of the wings is dark gray, but when at rest the wings are folded over the back, exposing the green lower surfaces. Identification: Upperside dark gray-brown. Underside ranges from bright green to dark gray-green; lower part of forewing gray. Postmedian line of white dots may be straight or bulged out, reduced, or lacking. Wing Span: 7/8 - 1 1/8 inches (2.2 - 2.9 cm). Life History: Males perch to watch for females in depressions or gulch bottoms. Females lay eggs singly on host plant leaves. Caterpillars eat leaves, although some prefer flowers and young fruits. Chrysalids hibernate. Flight: One flight from March-June. Caterpillar Hosts: Various species of wild buckwheat (Eriogonum). Habitat: Sagebrush scrub, chaparral, woodlands, subalpine scree. January 26, 2009 - The "butterfly bill" - Senate File 16 - passed 30-0 on final reading Monday in the Wyoming Senate, and the bill now proceeds to the House. Selecting a state butterfly was the idea of third-grade students last school year at Big Horn Elementary School in Sheridan County. State Sen. Bruce Burns and Rep. Rosie Berger of Sheridan County, along with Rep. Mary Throne of Cheyenne, have sponsored the bill, which would designate the Sheridan's green hairstreak (Callophrys sheridanii) as the state butterfly. Professor Scott Shaw, an entomologist in the University of Wyoming's College of Agriculture, supports the bill and testified before a legislative committee Jan. 22. "This lovely insect is distinctive, being one of the few green butterflies in our region," he said. Burns said this morning, "I believe the senators realize and appreciate the efforts of the kids in Big Horn as well as the educational benefits to them of watching the legislative process in action." He added, "I don't know if the Big Horn kids could have done this without Scott Shaw's support. His knowledge and enthusiasm put the butterfly bill over the top in the legislative committee." The Big Horn student who got the project rolling, Tanner Warder, has since consulted with Shaw on numerous occasions to learn more about Sheridan's green hairstreak. Warder worked with classmate Lydia Mayer to get input from other Big Horn students before presenting their idea to the Sheridan County legislators. Warder and Mayer joined Shaw in testifying before the committee, and other Big Horn students participated in the hearing via videoconference from their school. Shaw said, "I find the student project very interesting, and I anticipated this would happen in Wyoming (designating a state insect or butterfly) because we're only one of about eight states without a state insect." 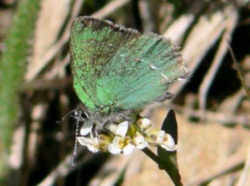 Sheridan's green hairstreak was discovered in 1877 near the location of present-day Sheridan, Shaw said. Both the town and the butterfly are named after Lt. Gen. Philip H. Sheridan, a famous Civil War commander; however, the butterfly was actually named before the town. 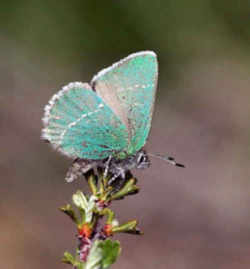 The butterfly occurs widely across Wyoming in mountains and foothills, wherever its primary food source (the sulphur-flower) is found, said Shaw, who, as curator of the UW Insect Museum, estimates Sheridan's green hairstreak is one of at least 12,000 insect species found in Wyoming. This butterfly species flies from March to June and is the earliest butterfly to emerge from a chrysalis (butterfly pupa) in Wyoming, Shaw said. To track the bill, go here. The law designating the Sheridan's green hairstreak butterfly as the official Wyoming state insect is found in the Wyoming Statutes, Title 8, Chapter 3, Section 8-3-122. AN ACT relating to state symbols; declaring the Sheridan's green hairstreak butterfly the state butterfly; and providing for an effective date. Callophrys sheridanii, commonly known as Sheridan's green hairstreak butterfly, is the state butterfly of Wyoming. Section 2. This act is effective July 1, 2009. 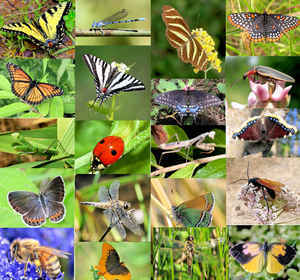 State insects are selected by 45 states of the 50 United States. Some states have more than one designated insect, or have multiple categories (e.g., state insect and state butterfly, etc. ).